have many pants and shorts to choose from. Wet clothes can ruin a day at the range or prove deadly in cold weather field conditions. Stay dry from the waist down wearing the Next Generation ECW Breathable Pant from Voodoo Tactical. Designed to offer convenient outerwear protection to the user's current uniform or apparel, the pants are an essential upgrade for any tactical professional. A windproof and water-resistant exterior provides crucial elemental protection at a moments notice. Extended, 15-inch leg zippers allow for convenient wear over boots, ensuring users will never have to remove boots or expose skin to the elements. 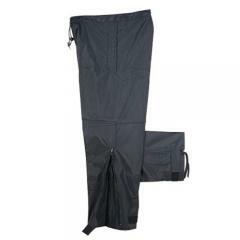 Once on, adjustable hook-n-loop ankle cuffs and a drawstring waist seal openings to keep water out. Specialized, pass-thru pockets line up with pockets of original pants to preserve rapid access to equipment and gear.